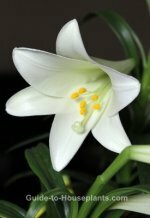 Baby's Tears plant gets its name from the tiny, round leaves cascading down slender, fragile stems. Other common names for this plant include: Mind-Your-Own-Business and Irish Moss. This fast-growing evergreen has a low, spreading habit that spills beautifully over the sides of a container. It won't grow far though, because the creeping stems need to have contact with the soil. Given enough light, it may produce tiny, single flowers in the leaf axils. Although this creeping plant seems well-suited for the moist environment of a terrarium, it is invasive and will crowd other plants. I'd recommend putting it in its own pot. Trim with scissors any time to keep it under control. Repot S. soleirolii in spring, when it outgrows its pot -- a wide, shallow pot will do. 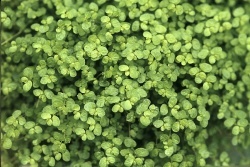 It makes a beautiful groundcover when planted under tall potted plants; however, it's a good idea to combine Baby's Tears with plants that prefer constant moisture. If you just can't walk past a plant without fussing with it, this one is for you. Water it, mist it, and prune it to your heart's content. Baby's Tears is formerly known as Helxine soleirolii and is still sometimes labeled by growers with that name. 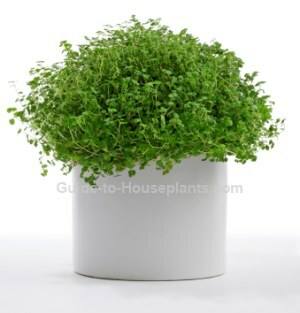 Don't be afraid to buy a small plant, this one grows fast. Some colorful varieties are available. 'Aurea' has golden-green foliage... 'Variegata' has silvery green variegated leaves. Light: Will grow in low light, but prefers bright, indirect light. Keep out of direct sun, which will scorch the leaves. Water: Keep the potting medium moist at all times. It will not tolerate dry soil. Humidity: This plant thrives in high humidity. Check out these easy tips for raising the humidity for house plants. Soil: Any good potting mix; African violet potting mix works well to maintain moisture which this plant craves. 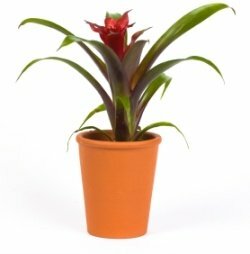 Fertilizer: Feed every 2 weeks spring through summer with balanced liquid house plant fertilizer diluted by half. Propagation: Divide plant into smaller clumps by gently pulling it apart.